Spring has sprung and that means it is time to change things up - in a good way! Packing lunches, snacks and on-the-go meals while making sure your family gets a nutritious meal they look forward to is no simple assignment. 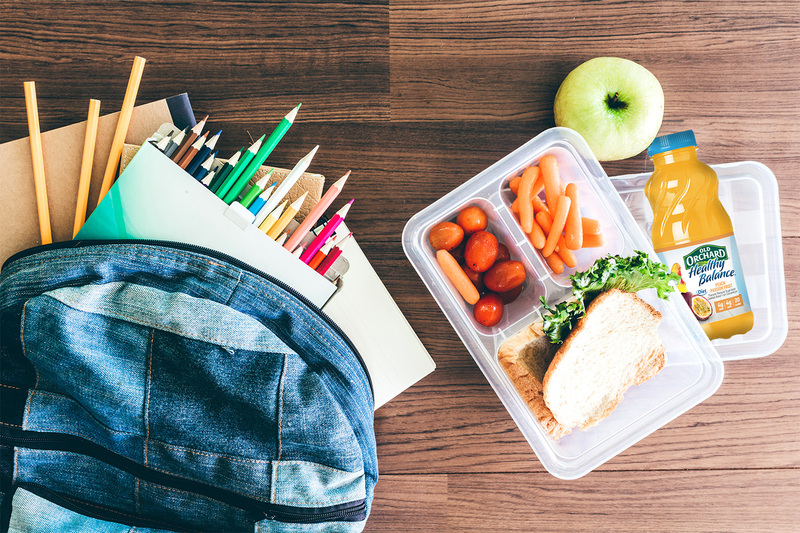 We have put together 5 simple tips to help you pack a positive lunch! Everyday is packed with new challenges, packing an enjoyable and effective meal is an opportunity to add a positive element to your day - even on the worst days. With these 5 tips, you will be a packing-pro in no time! Prioritize - Taste, Budget, and Health goals: Keep these three things in mind when preparing your lunches. By choosing to pack your lunch (or your family's) you are in control and can keep your health goals at the forefront. YOU get to choose what you and your family will fuel your bodies with for the day! Remember, if you are not excited to eat something at home, more than likely you won't be too thrilled about it at work or school. Packing your lunch requires a little more energy than buying your lunch, but that little extra effort can go a long way in saving your hard earned money. Eating healthy does not mean you need to compromise taste - simple adjustments take your lunch from 'meh' to 'YUM!'. Picking Colorful & Fun: Home packed lunches don't need to be dull and boring! Add some color and excitement back into your day by adding in colorful fruits, veggies, and Old Orchard Healthy Balance 10oz juice bottles! Perfect Equipment: Having the right lunch box is a game changer. Using compartmentalized lunch boxes helps keep the assembly process simple - no more snack bags required - and might I add aesthetically pleasing? Packed with nutrients: The easiest way for your family to eat healthy is by you providing them the means to do so. This doesn't mean strictly fruits and veggies, but spicing it up with some different proteins, nuts, etc. A little treat now and then is never a bad idea; treating yourself every now and then will decrease your cravings and help avoiding those junk-food binges. Prep-Time: Preparing your lunches the night before gives you more time to focus on what you will be adding. Let's be honest, we are not all morning people. Having your lunch packed the nigh before can create a smoother morning routine and not having to scramble to put something edible together. Old Orchard understands the importance of keeping life in a healthy balance and is now making smarter hydration on-the-go even easier with single-serve varieties of their best-selling Healthy Balance juice line. Now available in four fruity flavors: Apple, Peach Passion Fruit, Mango Tangerine and Strawberry Watermelon! Packing lunches just got a whole lot easier with Old Orchard's NEW Healthy Balance Single-Serve juice drinks! 10oz of refreshing fruit flavor - without all of the carbs and sugar! A perfect size to take with you anywhere - to school, on a run, to the gym, or even on a road trip and can be enjoyed by the whole family!